I am going through a Kale phase at the moment. I love it. I saw people pinning it on pinterest a while back and thought... wow... that does not look even vaguely good. But I decided to give it a try and now I seriously cannot get enough of it. When Paul calls from the store and asks what if we need anything else I say: "Kale. And lots of it. No, not one bunch. At least two." Preheat oven to 350 degrees. Spray (or grease) cookie sheet with olive oil. Lay Kale flat. Spray (or sprinkle) with olive oil. Spray (or sprinkle) with balsamic vinegar. Sprinkle with garlic powder, oregano, basil and sea salt (I use a little more garlic powder and a small amount of the others). Cook for 10-15 (watch for it to become crisp. My oven is rather unreliable and the cooking time varies). I hear that kale is pretty easy to grow, but like you I always thought it looked kinda, eh! I need to give it a try. ooh, oven chips of leafy greens? definately going to have to try that. If you peel a carrot, then cut the rest of it up with the peeler, the strips of carrot can be used to make very good chips in the same way. I used to use this as a garnish all the time when I still cooked for a living. Very nicely done, Cam. I'll put a little star next to this one. I like Kale Chips a lot too. I have always just made them with olive oil and salt, so I will have to try your recipe! 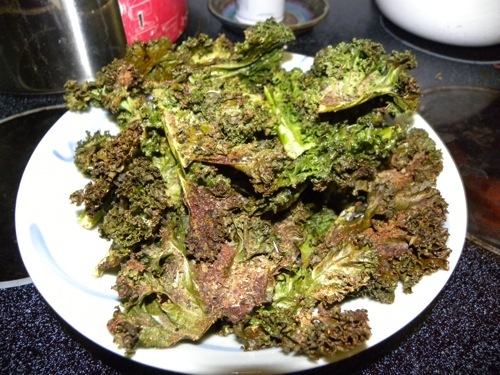 I made my first kale chips this week and they are so good! I will definitely be adding the balsamic vinegar to my next batch.